Kids love cold and fruity popsicles! 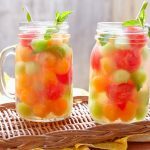 This is a great way to keep them hydrated during the hot days of summer using fresh fruit. Servings depends on the size of your mould. Make a simple syrup by boiling the water and sugar in a small saucepan. Let simmer and stir regularly until the sugar is dissolved. Add the mint leaves and lime zest at the end and stir it into the hot syrup. Set aside. Wash melon before cutting it up by rinsing under cool, running water. Cut into wedges, remove seeds and peel. 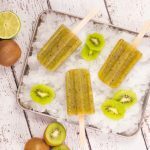 Cut into 1 inch cubes and place in a blender with lime juice and puree. If necessary, stop and scrape down the sides during this process. 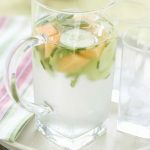 Strain the simple syrup to remove the mint and zest pieces. Then add the flavoured syrup into the blender. Pulse to combine well. 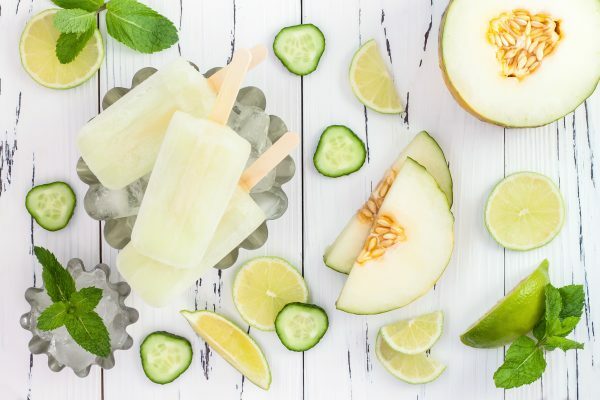 Pour into popsicle moulds of your choice, leaving a small gap at the top to allow for expansion when freezing. Tip: This is a great way to use up slightly overripe melon that is too soft to eat on its own.